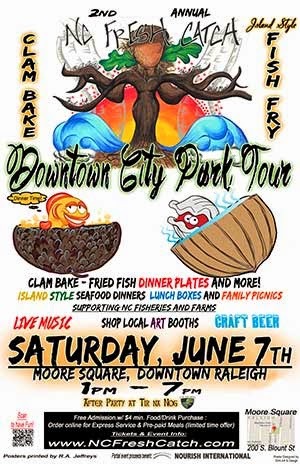 Get your summer started right this Saturday, June 7, at Raleigh's 2nd Annual Fresh Catch event in Moore Square. This is a Caribbean-style seafood feast that combines local art, live music, craft beer, and delicious seafood. Plates Kitchen, Tir Na Nog, and other local restaurants will mesh with master chefs from the Outer Banks, Kingston, Jamaica, and commercial fisherman for an onsite cooking and eating extravaganza. On the menu will be an OBX clambake, island style fish 'n chips, Jamaican peppered prawns, Jerk chicken, and more. Bring your own seats and blankets for a family picnic experience. No Caribbean celebration can be complete without music. Sharing authentic Reggae is The Kata Band, followed by the country acoustic sounds of Rissi Palmer, Winston Salem's The Heritage, and local band, Urban Soil. Hosting the event is the funk-rock and soul band, The Dye Wells. DJ Pangean will keep the party going in between sets with music from the past and present. Bring your appetite and your dance moves to Raleigh's 2nd Annual Fresh Catch event this Saturday in Moore Square. Tickets may be purchased here.